It is not necessary to continuously visit NRGpilot™ portals to keep track of IPP investments. Select who should receive automatic email reports and how frequently to keep track of system performance. Revenue, energy and alarm status are shown in the email subject line eliminating the need to open up the email if a summary is all that is needed. 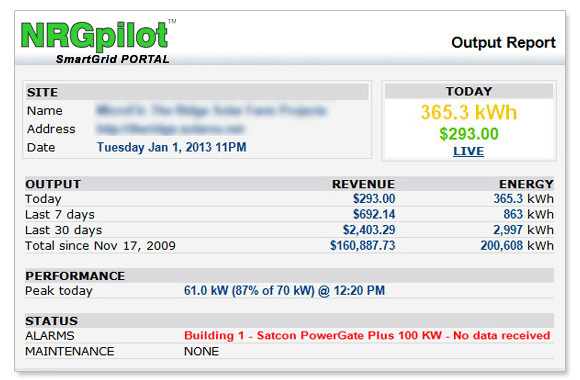 See daily, monthly and lifetime energy and revenues/costs at a glance. Click the LIVE link to jump directly to the site for further details if required. Email reports can be selected to meet different user needs. Select as many emails as needed. Specify frequency and type. Maintenance staff will want immediate alarms while an owner may want a weekly summary report. 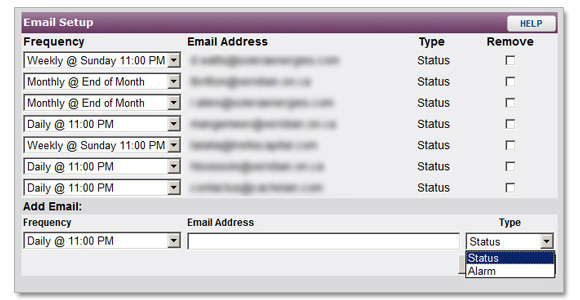 Quickly change entries any time by logging in to the email settings in SETUP.